Ronnie O'Sullivan gave himself a pre-birthday present for his first round win over Steve Davis today, to secure his place in top 16. 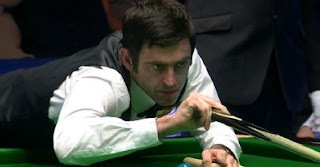 O'Sullivan, who is going to turn 36 on Monday lost the first frame but won the next six to capture a 6-1 win over Davis. Ronnie made 54 but it did not stop Davis to take the opener with 54. The two World and UK Champions battled for the following two frames but The Rocket took off afterwards, making breaks of 123, 97, 62 and 53 to win 6-1. The Rocket grabbed the points to secure his place in top 16 temporarily but the tough is getting tougher for him, he may face Judd Trump in last 16. "I made a few decent breaks, all round it was pretty decent. When you get some confidence you can get some momentum going. But I'm just glad to be in next round, it was nice to get a win and get through." Ronnie said. Davis praised his opponent: "I still loved going out there and playing, but your heart goes out when you fall behind and you can see how well your opponent is cueing. He over-powered me. I think best-of-11s suit him because he gets going quickly. If he keeps playing like that he'll be hard to beat." Marco Fu was the first qualifier to through to last 16. He defeated Australian Goldfields Open Winner by the scoreline of 6-4 despite being 1-3 behind in the match. The turning points of the match came in the sixth frame, Fu was called foul at 61 when 59 is remaining on the table. However, Fu was thrilled to level 3-3 after Bingham missing the brown to clear. Fu will be playing world number one Mark Selby who gave Ryan Day a whitewash with 111, 90, 86 and 69 in quick-fire his win. Selby: 'I'm really happy with the way I played. I won two tournaments in China earlier this season but that feels like forever ago now. If I can keep playing well consistently then I can win more titles. "There are so many good players now so to be introduced into the arena as the World No 1 felt great. There's a lot of travelling on the circuit now which is tiring, but I enjoy playing snooker anywhere. A couple of years ago we were all crying out for more tournaments." Ali Carter struggled today but still managed to beat Robert Milkins 6-4. 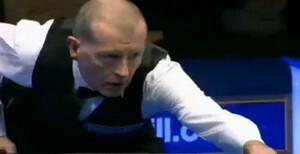 Martin Gould will face Shaun Murphy after beating Peter Lines 6-3. Murphy played 19-year-old Chinese Li Yan, it was first TV match for Li in a full ranking tournament. The Young Man placed pressure on The Magician, leading 2-1 with 95. Li began his fight back plan when he was 3-4 behind Murphy but Murphy finished his job with 58 and 67. 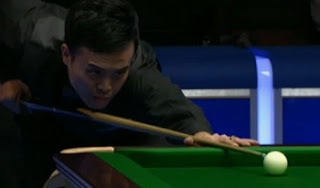 "It was a potential banana skin as Li looks a fantastic player, Rob Walker introduced him by saying he's beaten John Higgins and Mark Williams in PTC events this season. I didn't know that and it woke me up a bit at the start of the match." said 2008 UK Champion Murphy. "It must have been the biggest match of his career and he handled himself very well. He's the most naturally gifted player I've seen from China.